The name of the UK’s largest bronze sculpture which will be installed outside Theatre Royal Plymouth in Spring 2019 has been revealed. Sculptor Joseph Hillier has formally named the piece “Messenger”. The monumental sculpture catches a young actor in mid-performance, embodying the energy and creativity at the heart of the Theatre Royal and cultural life in Plymouth. Standing at seven metres (23ft) tall, nine metres (30ft) wide and weighing in at nine and a half tonnes, Messenger is the largest lost wax bronze sculpture to be cast in the UK and by far the largest bronze sculpture by volume at 25.6 metres cubed. Joseph Hillier said: “The title Messenger refers to the pivotal role the performer takes to breathe life into the words of a writer and the intent of a director. 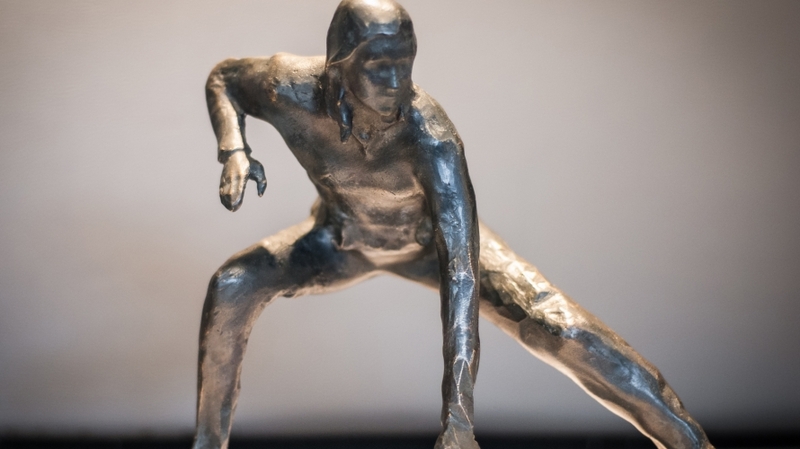 Hillier’s inspiration for the sculpture came from a split-second pose struck by an actor during rehearsals for Othello, Theatre Royal Plymouth’s award-winning and explosive co-production with Frantic Assembly in 2014. The sculpture has been created using 3D scans taken from the actor, who was poised, before bursting forward into the choreographed chaos of the play. Messenger is currently in the process of being created at the Castle Fine Art Foundry in the tiny Welsh village of Llanrhaeadr Ym Mochnant, using the ancient technique of lost wax casting. On schedule for completion in the New Year, the sculpture will be installed and unveiled to the public in Spring 2019.